I haven’t really taken advantage of the free Sprinkle cupcake giveaways until recently, and I figured that it’d be a great way to get me to drive the long 10 min drive to my local Sprinkles store (yes, I am lazy, which in this case is a very good thing or else I’d be at Sprinkles everyday). So, I made sure to coincide my trips during their special featured flavor events which are scattered throughout the months. First trip I made was to try their Raspberry cupcake back in August and then I went one more time the other week to try the Vanilla Hazelnut Chocolate cupcake. Featured Flavor + Free Cupcake = Very good deal indeed. The Raspberry Cupcake was surprisingly good. Both the cake and frosting were raspberry flavored. 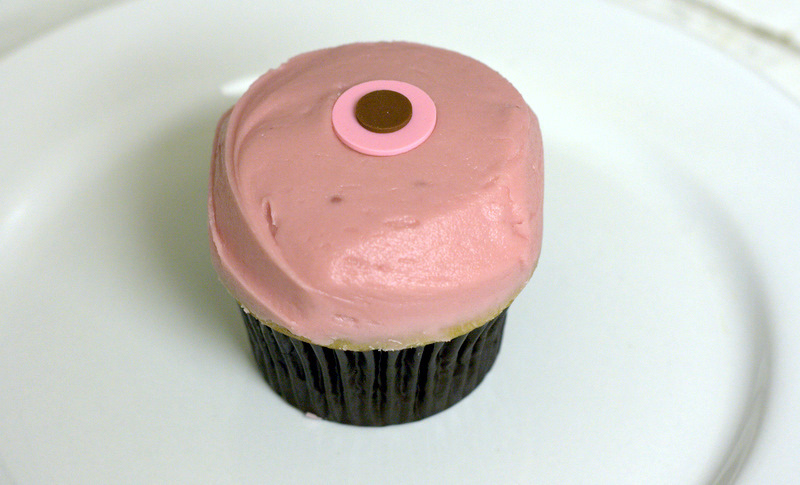 I wasn’t sure how they were going to pull off the raspberry flavor without making it taste artificial, but after one bite, I felt like they must have used hundreds of raspberries and packed it into one little cupcake. 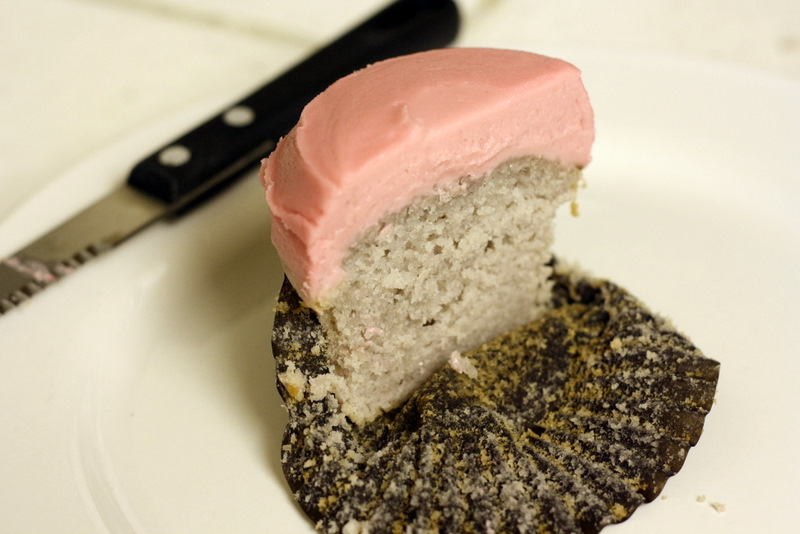 The frosting was the best part: not too sweet, nice tartness, and a bold raspberry flavor. The cake was not too shabby. It was moist, had less of the raspberry flavoring, but the only thing that threw me off was the coloring. The cake was gray. Weird, but tasty. At this point, I wouldn’t mind if they put some food coloring…maybe a nice bright pink/magenta? I don’t care, just as long as my food is not gray or anything resembling cement. Now, onto the Vanilla Hazelnut Chocolate Cupcake. This was Sprinkle’s take on a vanilla cupcake with a Nutella flavored frosting. This cupcake was good, but defnitely not the best and I think I would have much rather have a vanilla cupcake with Nutella smothered on top. I don’t think anyone can come close to getting that Nutella flavor unless you actually use the hazelnut spread. The frosting had the hazelnut taste, but I really felt like the flavor was diluted. More Nutella please! Actually, forget the cupcake, I could just eat Nutella by itself with a spoon. Sprinkle's Vanilla Hazelnut Chocolate Cupcake - Cupcake was a little damaged during handling, sorry. Tried the cake and it was kinda hard to cut into 4 pieces, it was too thin. But… We abletulosy loved the frosting!! However all of it together is like sugar overload… in a good and a bad way!! Overall I would say it is worth trying, and by the way your pictures are really chic and cool!